Chef Rick Lewis is showing the world how it's done. One is the king of 'cue in the Lou; the other is a James Beard-nominated chef. 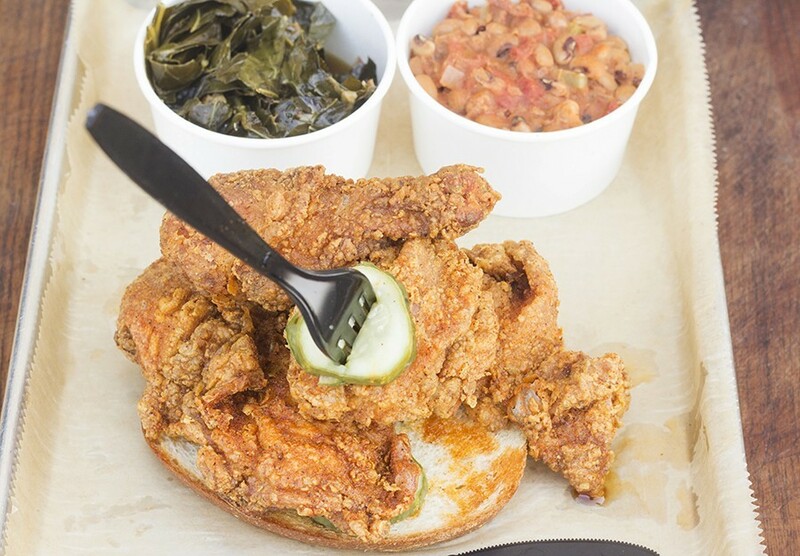 There was no question that Mike Emerson and Rick Lewis' Southern (3108 Olive Street, 314-531-4668) would be the place in St. Louis to enjoy a plate of Nashville-style fried chicken. The real surprise is that the year-old chicken joint may be every bit as good as what they're serving in Music City, U.S.A. Some serious R&D went into developing Southern's searingly spicy fried bird, with Lewis plucking ideas from the country's best purveyors of hot chicken. His efforts yielded a juicy, deep-fried chicken that is dipped in such an addictive chili oil glaze, you can't stop eating it even as beads of sweat dot your forehead and smoke comes out of your ears. Regardless of the spice level — whether you order mild, medium, hot or "clucking hot" — Lewis has managed to concoct a seasoning blend that allows you to experience the flavor. Sure, they call it Nashville-style hot chicken for now, but the version Lewis is serving right here in St. Louis might make them think twice about it.